This gorgeous attache case will make a lasting impression as your recipient will open to find three noteworthy wine selections: Kendall Jackson Chardonnay, Chateau Ste. 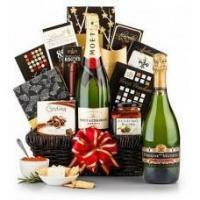 Michelle Cabernet Sauvignon, and Wolf Blass Yellow Label Brut Sparkling Wine. 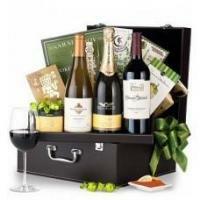 For pairing and sharing, we also include Fresh Pistachios, Jordan Almonds, Rosemary & Roasted Garlic Crackers, Moonstruck Chile Variado Dark Chocolate, Saraivanov Smoked Salmon, Jumbo Toffee Peanuts, Key Lime Truffles, Chardonnay Wine Biscuits, and much more. 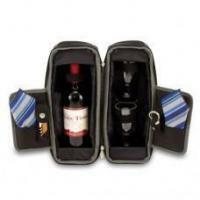 After the food and wine have been enjoyed, the one-of-a-kind, triple wine case with removable serving tray is ideal for storage in the home or office. Measures 15" x 13" x 7". 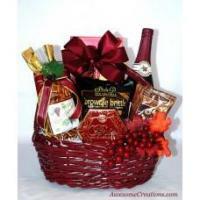 Due to state alcohol laws we can only ship wine baskets to the following states: AK, AZ, CA, CT, HI, ID, IL, MI, MN, MO, NC, NH, OH, OR, SC, VA, WA, WV, WY and DC. Hand delivery is not available on this gift. Ships from South Caroliina. Illinois is a 2 business day ship. 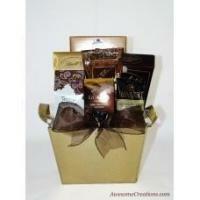 Located in the NW suburbs of Chicago, Awesome Creations, Inc. has been serving the gift needs of individuals and the corporate community since 1998. 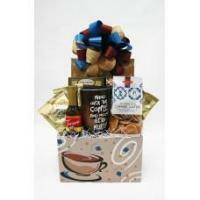 Our online gift shop offers an extensive line of unique gift baskets, distinctive corporate gifts, and personalized gifts for all occasions. Our mission is to provide a gifting service founded on Christian values and integrity with a strong commitment to offer superb creativity, impeccable quality, and superior customer service. We are passionate about what we do and it shows in our workmanship. 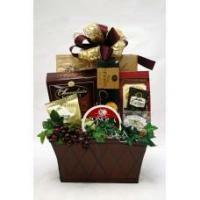 As you browse through our online shop, if you don't find exactly what you are looking for, we will gladly customize a basket to meet your needs and budget ... or locate just the right corporate gift or promotional item. 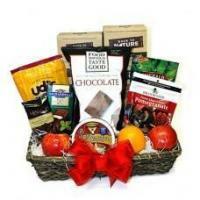 All the baskets on our website are custom created in our shop when your order is placed, unless otherwise noted. Thank you for visiting us, we would love to have you as one of our customers.